Great Care knows that the benefits of quitting smoking are wide-ranging, from lowering cancer risk and boosting immune systems to building strong bones and muscles and preventing emphysema. Even Disney has made its dedication to healthy families clear here in the U.S. by banning smoking and vaping from its parks in California and Florida starting May 1. Smokefree.gov reminds smokers there is no safe amount of cigarette smoke. When you smoke, the chemicals in tobacco reach your lungs quickly every time you inhale. • Quitting can help you add years to your life. • Smokers who quit before age 40 reduce their chance of dying too early from smoking-related diseases by about 90 percent. • Those who quit by age 45–54 reduce their chance of dying too early by about two-thirds. 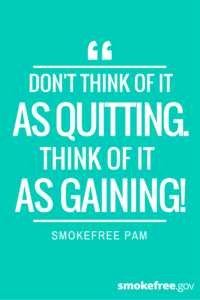 You can take control of your health by quitting and staying smokefree. • Over time, you’ll greatly lower your risk of death from lung cancer and other diseases such as heart disease, stroke, chronic bronchitis, emphysema, and at least 13 other kinds of cancer. The Smokefree.gov website offers valuable resources to help with smoking cessation, reminding smokers that everyone’s smoke-free journey is different. For more information on local smoking cessation programs through your hospital or community groups, contact your healthcare provider. The American Lung Association is also a valuable resource for helping with smoking cessation and support. 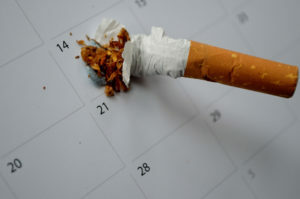 The American Lung Association’s Freedom From Smoking program has helped hundreds of thousands of people quit smoking since its first release in 1981. The program includes resources to help smokers quit, including in-person group clinics, an online support community, and the 1-800-LUNGUSA telephone counseling. 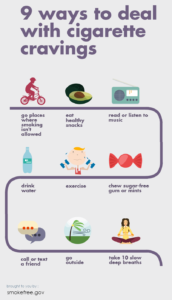 Learn more about the Freedom From Smoking program and how it can help you, too. Believe, and anything can happen!